12 pp. Roman, 277 pp. This book is concerned with sense-making and knowledge production as linguistically mediated social processes. Fundamentally, two kinds of processes are discerned here, namely scientific sense-making and everyday sense-making. The central questions asked here address the theoretical and methodological framework needed for a methodologically rigorous reconstruction of practical, everyday sense-making, i.e. the transformation of every-day knowledge into scientific knowledge: How can scientists reconstruct and explain everyday sense-making and knowledge production? Which resources, of a scientific and every­day kind, can or do they need to draw upon? These questions, while they may be relevant for scientific reasoning in general, grow more acute in a situation, where the scientist experiences a profound difference between his or her own resources, inventories and practices and those of the studied object(s). This is the case with this study; in fact, the difference between the way the Herero speaking community of Omatjete in the Northwest of Central Namibia knew and talked about things and Beck’s sense-making practices gave rise to these questions. Consequently, the attempt at a clarification of an adequate theoretical background which integrates language use – talk-in-interaction – and therefore language itself as social practice, and the methodological consequences in form of an Ethnographic Conversation Analysis are here understood as a prerequisite for reconstructing Herero ways of knowing and talking things. Fieldwork for this study was carried out from 2003 to 2007 in the course of seven field stays of be­tween three weeks and four months duration. Overall, a period of 14 months was spent in Omatjete, Omutiuanduko and Windhoek/Namibia. Most of the time was spent in the village of Omatjete with frequent trips, in the beginning all over the Communal Area, later on mostly to Omutiuanduko, where the research focus was set. 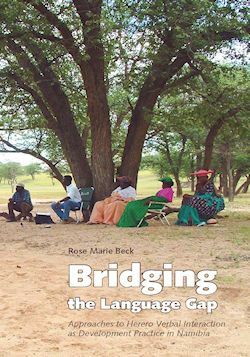 Overall, "Bridging the Language Gap" is a very interesting and thought-provoking book. The book comes with a DVD that has the audio clips of the examples in the book as well as giving the examples with the interlinear glosses. It is well worth the read and I recommend it to all Africanist linguists.